Face Off - We’re off to see the Wizard...of Wonderland? 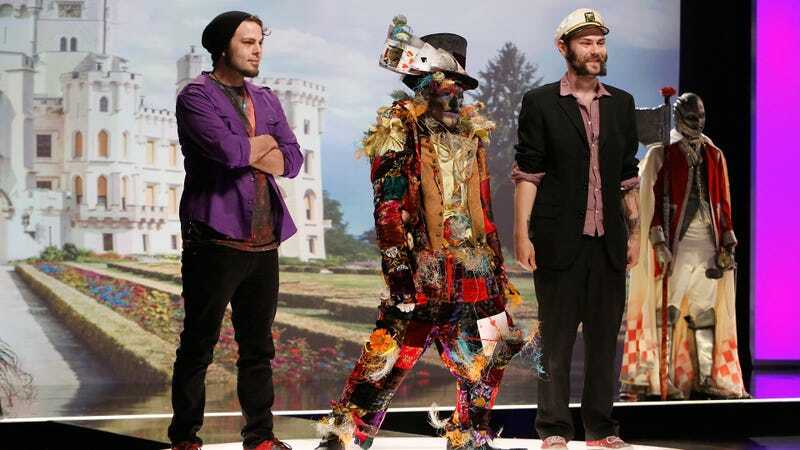 On this week's Face Off the challenge was to take a character from the Wizard of Oz and put it in Lewis Carroll's Wonderland. The five teams of two went to work and the results ranged from wonderfully good to not so wonderfully bad. Results ahead. The Wonderland Scarecrow shown at the top was a good concept but flawed in execution. While it didn't win I really liked the Wonderland Tin Man. From my time painting miniature soldiers and gear I know how hard it is to get metal and rust to look right. The Flying Monkey turned jester rightly won and Dina racked up another win. Stella was the fan favorite again and I think she has a good shot at making the finale. The Wonderland Cowardly Lion was the losing design. Sasha needs more confidence in herself and to be more assertive in a team. She was right that they needed the design to be more whimsical. Since he was responsible for the poor concept Jason was sent home. Next week it's Judge Match as the judges compete against each other for charity. All images are from Syfy and you can see all the designs here.